Bonny Truong | HACK It! 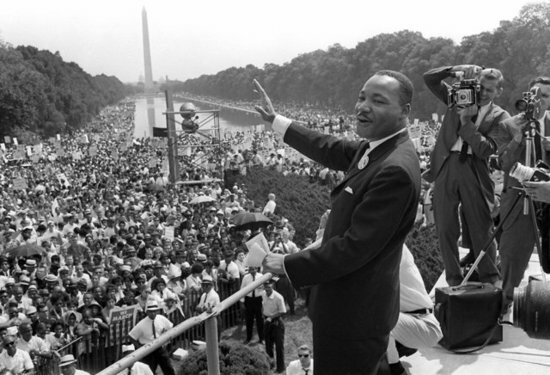 MACRO Hack: Equal Rights and Martin Luther King Jr. This image can be found from popsugar.com, specifically http://www.popsugar.com/tech/Listen-Martin-Luther-King-Jr-Speech-26935858. This is a photograph of Martin Luther King Jr. during his “I have a dream” speech on the steps of the Lincoln Memorial. This image is 550 by 375 in size, but there are other sizes that this image can be found as. The format it is in is jpg. On popsugar.com, they use the source Getty. After looking through a couple images, I found this one on gettyimages.com which photo credits AFP/stringer. This can be found at http://www.gettyimages.com/detail/news-photo/civil-rights-leader-martin-luther-king-jr-waves-to-news-photo/51620952. The image is pretty clear, except for the crowd’s faces and the trees in the far back. This is something that many pictures would have to have, too because there are so many people in the crowd and the trees are very far away. This photo is in black and white. They might not have had color printers back then, or if they did, it might have been too expensive. Another reason why this picture could be in black and white is because maybe it came from a newspaper article. Before searching anything on Google to find an image, I looked through HIST to see if there were any images that I wanted to write about. I came across an image of Martin Luther King Jr. giving his speech. That image is somewhat similar to this image, but the one in the book is in color and more cropped. Once I saw this image, I decided that I wanted to use it for my MACRO hack, so I searched up “Martin Luther King Jr. Famous Speech” in Google Images, and I found this picture. There is no specific date that tells when this photo was taken. However, Martin Luther King Jr. gave his speech on August 28, 1963. Assuming that this photo was taken on that day, it was probably produced for newspapers and such within the next week of September 4. Looking at this article, there is a similar image to the one I found, but it is a different angle http://abcnews.go.com/US/things-make-dream-famous-speeches-history/story?id=20068795. It says that the picture they found was taken “One Day in 1963.” This is the most specific thing I can find about the date of this image. I am highly positive that it was taken on August 28, 1963, but I do not know when it was posted online. The purpose of this image is probably to mark and remember the time when Martin Luther King Jr. gave an iconic speech. The speech that he gave prompted the 1964 Civil Rights Act. This picture seems like it would most likely be on a newspaper article. This image shows some of the many supporters that Martin Luther King Jr. had at that time. The reason why I chose this image is because of the racism many people had to go through. I absolutely hate racism, and I have strong feelings about it. Whenever reading history about it, it upsets me. However, seeing an image like this is inspiring. Martin Luther King Jr. is inspiring. This photo exemplifies how much support one person can get if many people work together to get to one goal. In this case, many people are supporting Martin Luther King Jr. for equal rights for the African American/black people. There are obviously hundreds, maybe even thousands, of people supporting Martin Luther King Jr. That just shows how powerful he is and how much the people want change. Looking at the image again, I get shivers and chills. I get them because when you look to the distance, you can still tell that there are still people. You can’t tell when there aren’t any people. 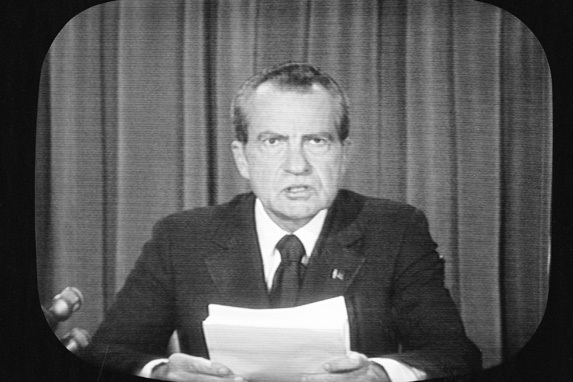 Today, Professor Putnam talked about the 1972 election then talked about the 1974 impeachment of Richard Nixon. He showed us a video on him resigning and giving up his place in office. I remember sometime last week in my RWS class, my teacher was showing us a scene from Futurama, and there was a scene with Nixon’s head (since the show is set in the future). I thought it was weird and funny how in the show, they preserve only their heads. I researched a little bit more on this since I don’t watch Futurama and I found out that in some episodes, they reference the real life Nixon. In one episode, Bender, Fry, and Leela blackmail Nixon with an audiotape and this references to the Nixon tapes where he secretly recorded things. There was another episode where they referenced the scandal when Nixon resigned. It was when he was sating in the Watergate. It’s really interesting how television shows reference historical things. I don’t watch Futurama, but I am 90% sure that many other television shows have subtly given historical facts in their shows. 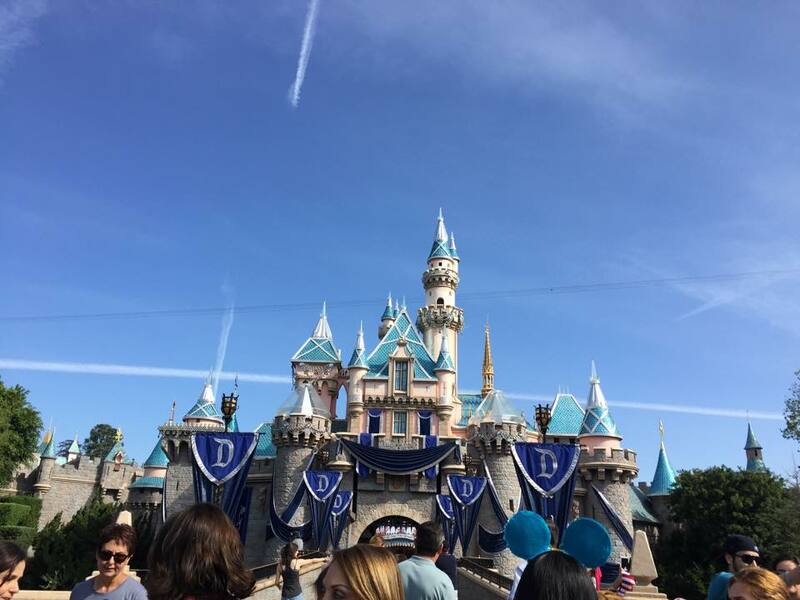 This past Spring break, I went to Disneyland. While I was there, I remembered that Professor Putnam was talking about it and how it was a product of the Cold War. It was really interesting walking down Main Street because I was imagining and thinking to myself, “Is this what the world was like years ago? ?” I took this picture when I was there, and I think it looks cool because the airplane steam kind of look like “missiles.” I wish I had “You are haunted by history” flyers to put up all over the park (though I might get in trouble.. haha). So this week, my hack is of one of my closest friend and I having a conversation. We were having a casual conversation when she brought up different countries and what they did. She brought up Russia and talked about atomic bombs and stuff, and it was really ironic since we just talked about atomic bombs this week. 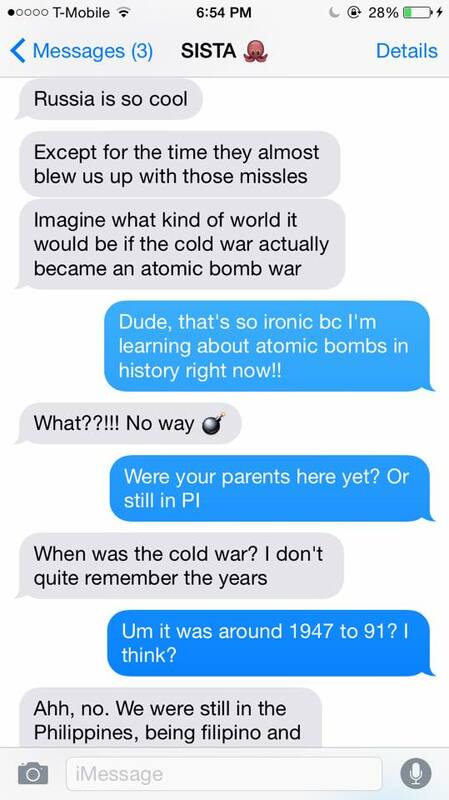 It was also ironic since she was also learning about the Cold War when she goes to school in Connecticut. It’s really fascinating when someone far away from you can be learning the same thing as you. HACK #2 — Martin Luther King JR and John F Kennedy at SDSU?! So this post is late because I did not have time to post it before, but on February 12, one of my friends from the Bay Area came down here for a tour of SDSU. After finishing class, I jumped into the tour. 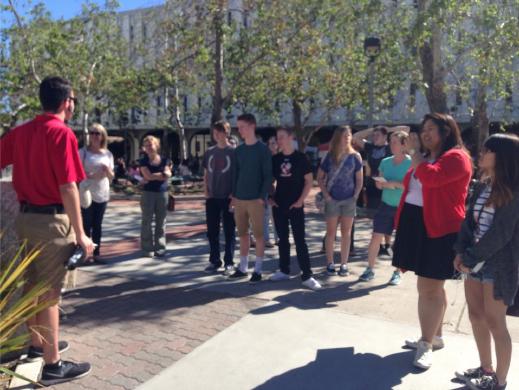 Prior to coming to SDSU, I did not go on a tour, so I was really interested at what the tour guide was saying. When we got to the Viejas Arena, he told us something that I thought was VERY interesting. He told us that in the Aztec Bowl (next to the Viejas), President John F. Kennedy gave a commencement speech! And he also mentioned that if we didn’t believe him, there was a plaque that said JFK actually did give a speech in the Aztec Bowl. Then when we passed the Cal Coast Amphitheater, our tour guide said that Martin Luther King Jr. gave a speech in there! I was really surprised and interested. I found out that MLKJR gave a speech the year after JFK did. Attached is a picture of my friend and I on the tour and the two links are information on the two speeches. 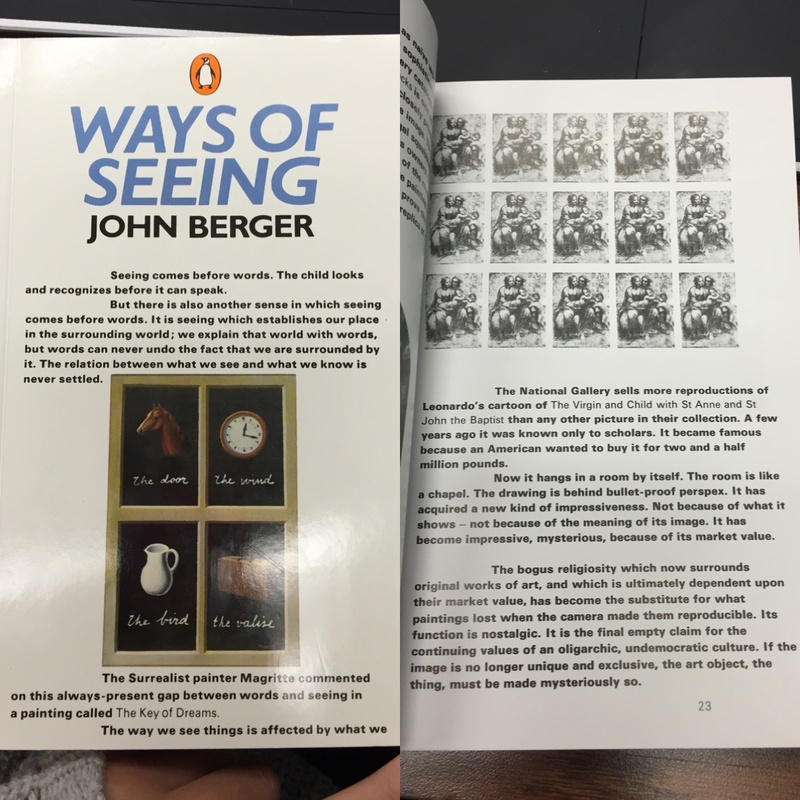 Today, I was reading a book for my literature class titled, Ways of Seeing by John Berger. Whenever I read a book, I never can really focus, and I always get distracted. On this page, there is a paragraph that is talking about a painting that says, “Now it hangs in a room by itself. The room is like a chapel. The drawing is behind a bullet-proof perspex” (Berger 23). This part was what got me distracted, and I started to think about history. I started to think about how weird it is that people like looking at paintings and drawings that were made years and centuries ago and how people treat art with care and basically like royalty. I also started to think about museums and how they are filled with things from the past. This reminded me of how Professor Blum was saying that we are haunted by history, which we are! I think it is really funny that we are surrounded by so much history that we do not really notice until we actually stop and think about it. Berger, John. Ways of Seeing. London: British Broadcasting, 1973. Print.